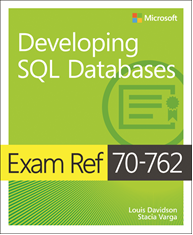 The Microsoft 20762B Developing SQL Databases course is designed to prepare students to undertake Exam 70-762: Developing SQL Databases which is the second exam that need to be passed to attain the certification – MCSA SQL 2016 Database Development. During the Microsoft 20762B Developing SQL Databases course, students learn number of concepts from designing tables and implementing them to describing advanced table designs and ensuring data integrity through constraints. Also, student comes across different aspect of SQL 2016, be it describing indexes, designing views, stored procedures, user defined functions or responding to data manipulation using triggers, implementing managed code in SQL Server and working with spatial. After completing the Microsoft 20762B Developing SQL Databases course, students will be able to apply the concepts learned through the training for developing databases and implementing managed code in SQL Server. What is included with the Microsoft 20762B Developing SQL Databases Course?